In the annuals of recorded time, there exist a few rare and memorable icons that define a place, an individual or even a profession. For the Maine guide, those emblems include the Venerable Grand Lake Canoe, the checkered wool guide coat, the L.L. Bean boot and of course the dark and hearty Maine guide coffee. On its most basic level, there really is nothing all that special about the main ingredient in a properly brewed cup of Maine guide coffee. Many sports will claim that the coffee is the best they ever tasted and conclude that it must be derived from some type of special, expensive and hard to get secret blend. What many don’t realize, is that Folgers or Maxwell House are the brands of coffee most typically used, by a majority of guides and sporting camps, neither being rare or likely to impress defined palates. For a true coffee connoisseur to brew this concoction at home and ungraciously slurp it down, it would be unlikely they would think much of these brands of coffee, prepared in such unceremonious fashion. What is missing from the recipe however and the secret to creating a truly exquisite cup of Maine guide coffee, is something that exists far beyond the type of coffee used. Skilled preparation, exquisite landscape and laid back attitude all work to make a typical cup of coffee just north of extraordinary. Even absent of sugar and cream, it has been said that Maine guide coffee only needs to be sweetened by the scenery and lightened with the pleasurable memories of a day of fishing to make it the perfect beverage. The perfect cup of Maine guide coffee is typically served during a shore lunch. It is rendered in a ceramic or steel “camping style” percolator, filled with lake water, a pinch of salt and then brought to a rolling boil over an open fire. This initial boil is done to ensure that any potential microscopic parasitic organisms meet their demise. After the water has boiled, it is taken off the direct heat and placed next to the fire, reducing the water to a slow simmer. Pouring coffee grounds into boiling water can cause the grounds to get over extracted, creating a cup of Joe ripe with bitterness and acidity. The standard measure of coffee for the taste buds of most mere humans is approximately 2 Tbs. per 6 oz of water or 2 Tbs for every 1/8 cup. It is my belief that this measure makes for a cup of coffee that I would give to a small child. For an adult styled beverage, it would be my suggestion to double the prescribed amount of coffee grounds. This “heart paddle” blend is sure to jump start even the most sleepy sportsmen or hungover Maine guide. Lastly, the percolator should be pulled from the fire and allowed to set for a few minutes, to let any errant grounds settle to the bottom. It will then be slowly poured into an old ceramic coffee cup, that absolutely must be chipped or cracked. Sipped slowly while sitting beside the waters edge, it isn’t hard to see why Maine guide coffee is typically best described as amazing. For the lucky, few that have had this unique and unforgettable experience, you have certainly come to understand that in life enjoyment is derived from the little things. Enriched are our bodies, minds and spirits by the simple and natural beauty of our surroundings. 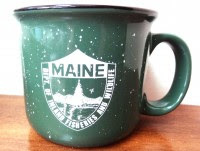 Next time you unceremoniously chug down your cup of coffee from Starbucks, reflect on my words and make yourself a promise to one day drink Maine guide coffee. If you are in the market for a cup of Maine guide coffee, I suggest making a reservation at one of the oldest and most famous sporting lodges in the country, Weatherby’s. Their fishing and hunting lodge originated in the nineteenth century and has become a way of life for many sportsmen looking for a quality outdoor experience. If you join Weatherby's for the 2012 season make sure and tell them the Rabid Outdoorsman sent you! Enjoy! We've been promised a guide lunch up at the thoroughfare this coming Sunday. Do you suppose Maine Guide Coffee will be one the menu? PBM, You may want to order ahead. That crew tends to leave the coffee pot behind to make room for more beer. I have already been warned by the Duckman NOT to drink your coffe when I come to Maine. I believe his term for it was "Devil's Brew". If you can stand a spoon straight up in a cup of coffee it is just about right. Ashley, Thanks goodness there exists a Mainer out there who appreciates a good cup of coffee! Great coffee! Sweet and kicking! Gotta love Maine outdoors coffee.. only thing better is fresh air. ThermaCELL Helps Reclaim the Outdoors!